The I-75 South Metro reversible express lane project in Atlanta, (USA) recently opened along almost 21km (12 miles). The Georgia Department of Transportation’s (GDOT’s) NaviGAtor software will monitor the express lanes and will help displaying current toll rates on changeable message signs and other messages such as comparative speeds, showing the current average speed along the corridor for the express lanes and general purpose lanes. 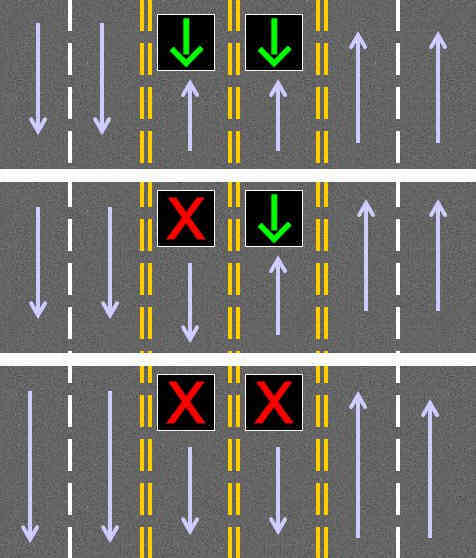 The idea behind reversible lanes is old, elegant and smart but not easy and not safe as expected to operate. One of the most iconic places where this operation can be seen is at The Golden Gate's, which debuted in 1963, made traffic jams rarer and less severe, although sometimes deadly. However, this debate is over with the "Zipper", as it can be seen in the video below. With driverless cars almost here, will we see the blooming of these type of schemes?